November has been a busy month for me - between packages from Ryan, Hiro and some other stuff I ordered from various places I've had quite an influx of cards this month. I think it's somewhat appropriate (and also way overdue) to finish the month by talking about the last of the box sets that Ryan included in his package that I got back at the beginning of the month - the Rookie & Young Stars sets from Front Runner (aka Frontier International) from both 2013 and 2014. Each Rookie & Young Star set is a box set containing cards for one particular team. The base set for each set is pretty small - between 24 and 27 cards. Each set includes possible autograph cards and (in several cases) short printed rookie cards. 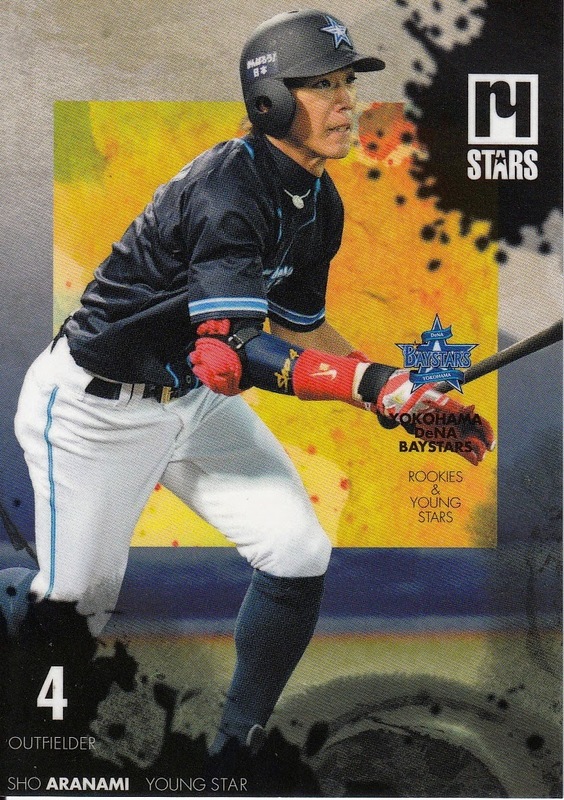 Rookie & Young Stars is kind of a misnomer for the sets as the sets tend to include the same number of "established" stars as "young" stars. 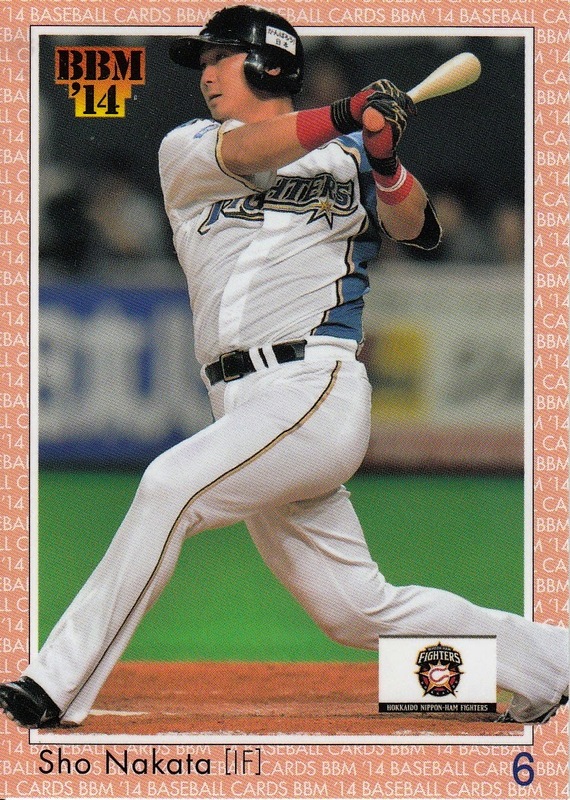 And of the six sets I'm going to discuss in this post, only one of them actually contains any rookies in the base set. Some of the sets also include OB players. 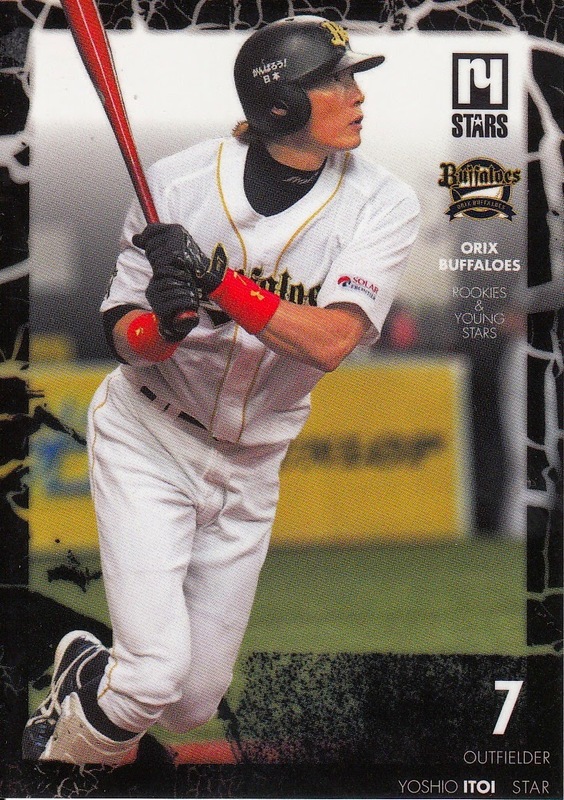 Generally, each set uses a slightly different format between the "Stars", the "Young Stars", the "Rookies" and the OB players ("Legends"). 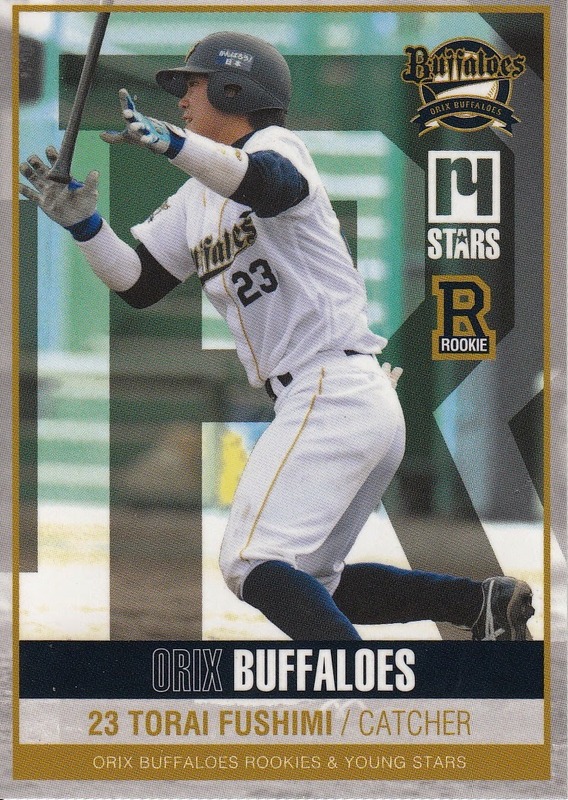 The cards for the base sets for both the Lions and the Buffaloes sets can be seen at Jambalaya and Ryan did a post on the Buffaloes set. 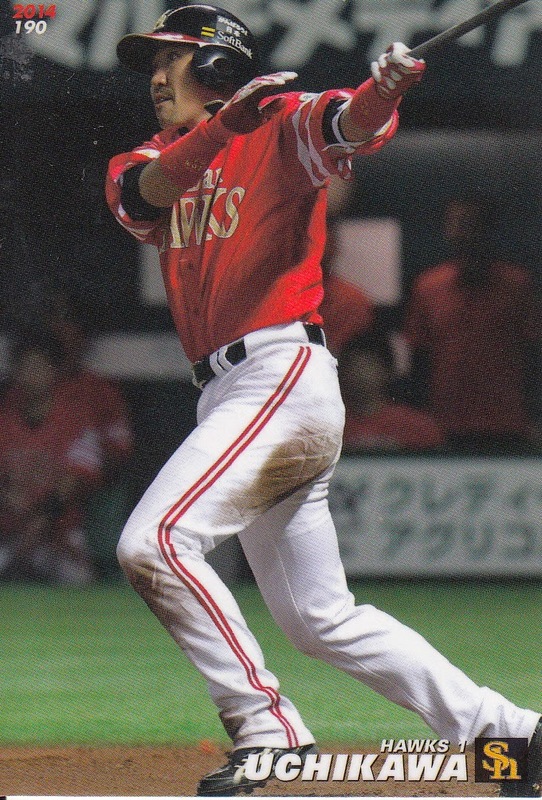 Front Runner did four of these sets this year (along with at least seven other sets), adding the Carp to the fold along with returning champions the Lions, Buffaloes and Baystars. All four sets came out in March and April, which means that a number of the players who just joined the team in the sets are shown not playing, but rather wearing a team jersey over street clothes, presumably at the press conference announcing the player joining the team. The Lions set is the only set that actually has a different format for the "Stars" (8 cards) vs the "Young Stars" (14 cards) and "Lions Legends" (2 cards). The remaining four sets each have a different format than each other, but the cards in the various subsets have only minor variations in format. 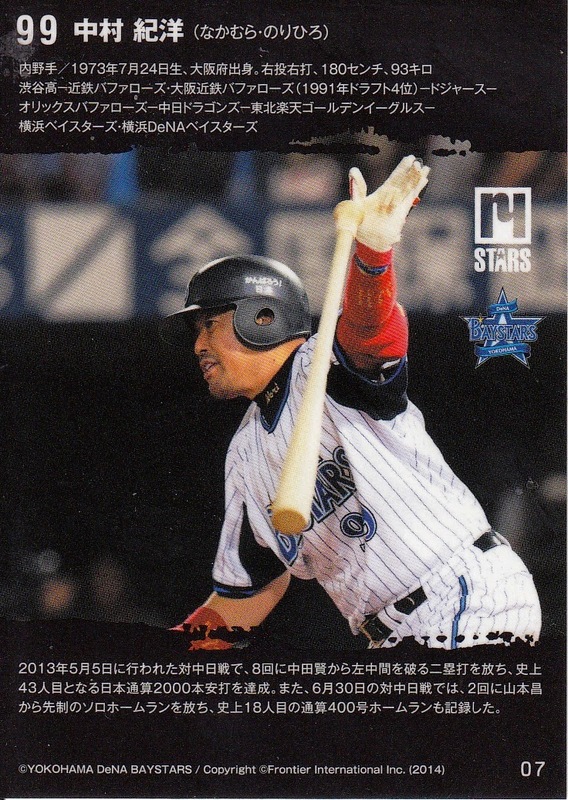 Regardless of the team, each of the "Young Star" cards has a big colored square behind the player. 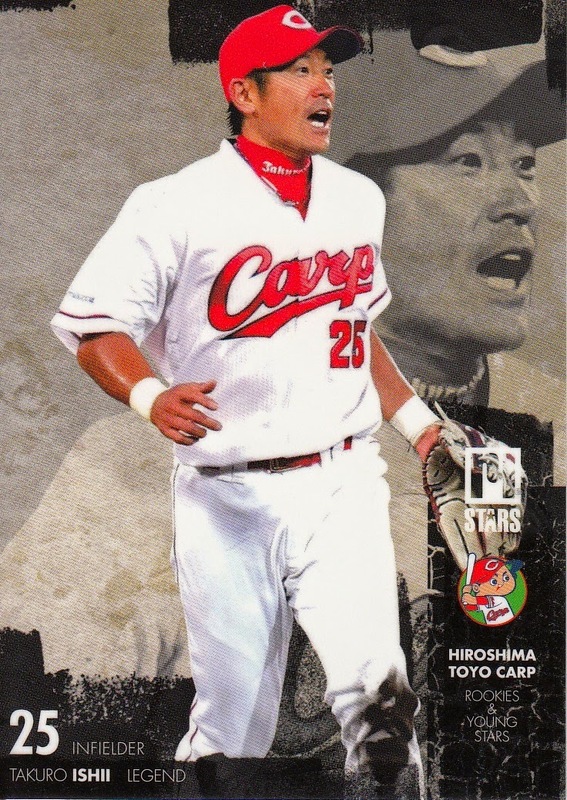 The Carp set has 8 "Stars" (plus the manager), 11 "Young Stars" and 3 "Legends". 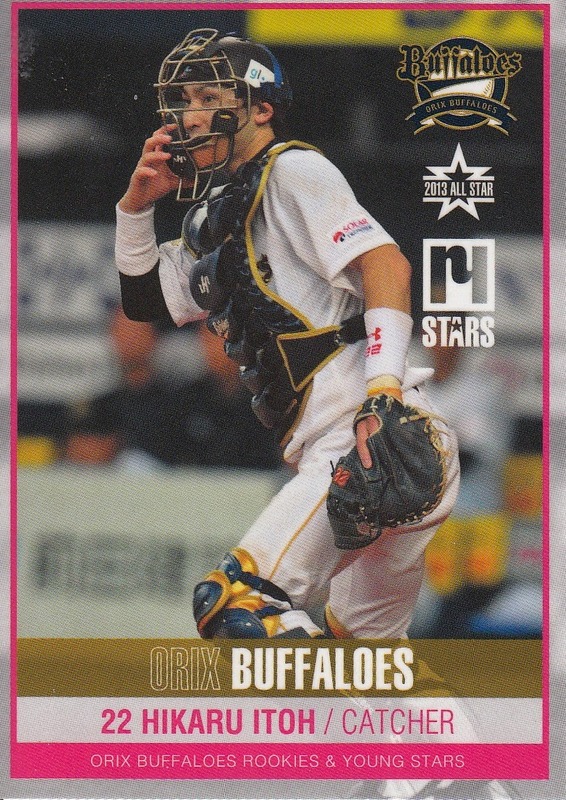 The Buffaloes set has 15 "Stars" (plus the manager) and 9 "Young Stars". 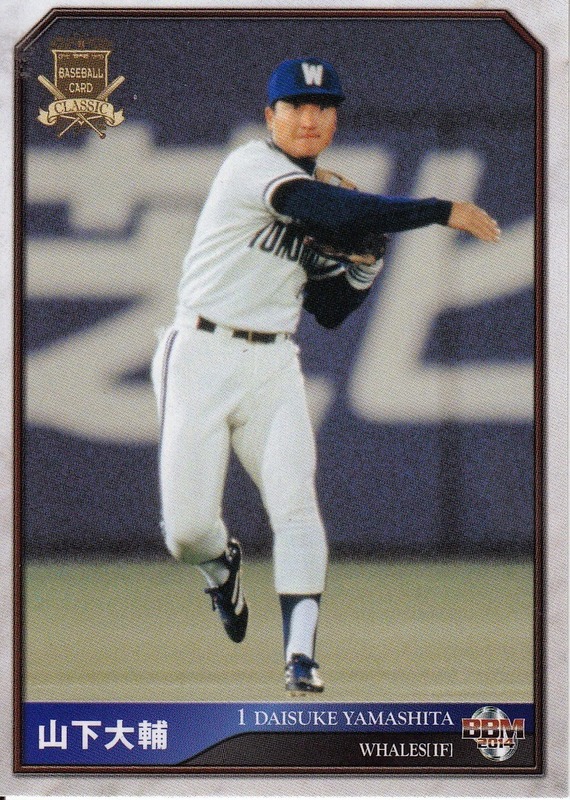 The Baystars set has 9 "Stars" (plus the manager) and 14 "Young Stars". 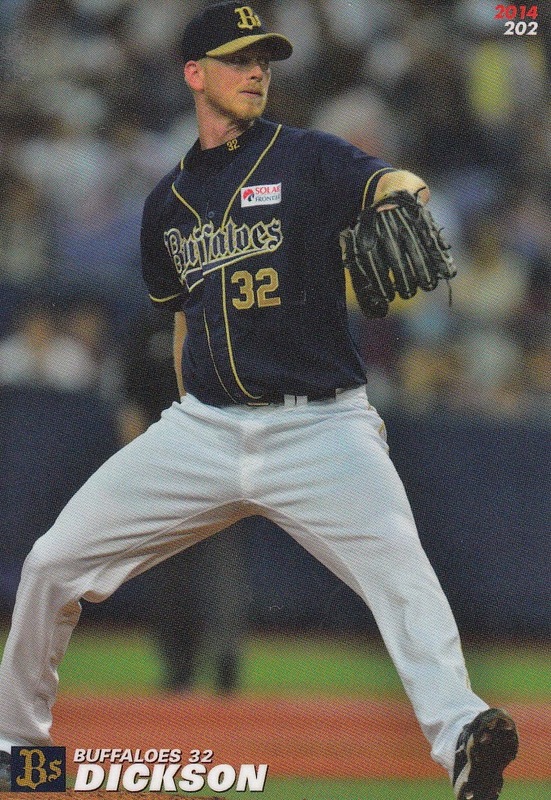 I have to admit that when I first saw the 2014 cards on-line, I wasn't very enamored of them. I felt they were kind of ugly. But they actually look a lot better when you're holding them in your hand than they do on your computer. 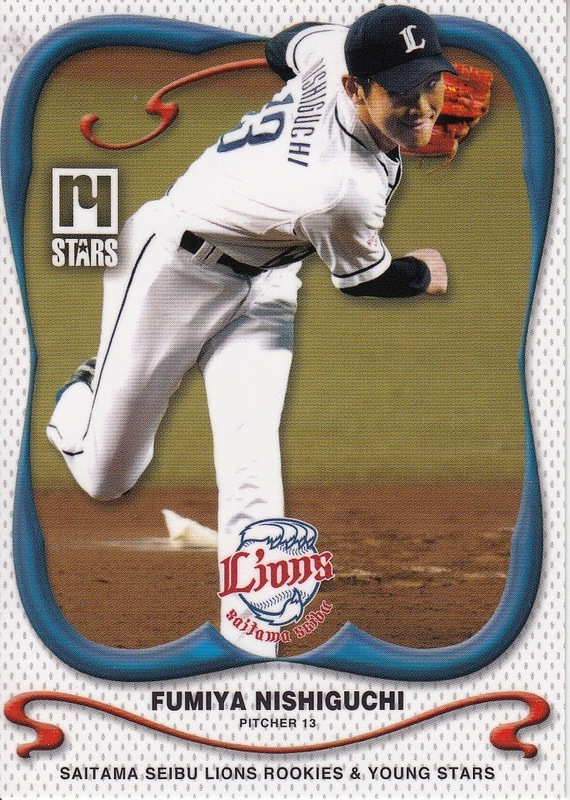 You can see all the cards in each of the sets over at Jambalaya (Lions, Carp, Buffaloes, Baystars) and Ryan has done a post for each set as well in which he covers all the "special" cards available with the sets (Lions, Carp, Buffaloes, Baystars). There are two more sets for this year that I haven't mentioned - one of them actually was released last week and the other will come out in late December. 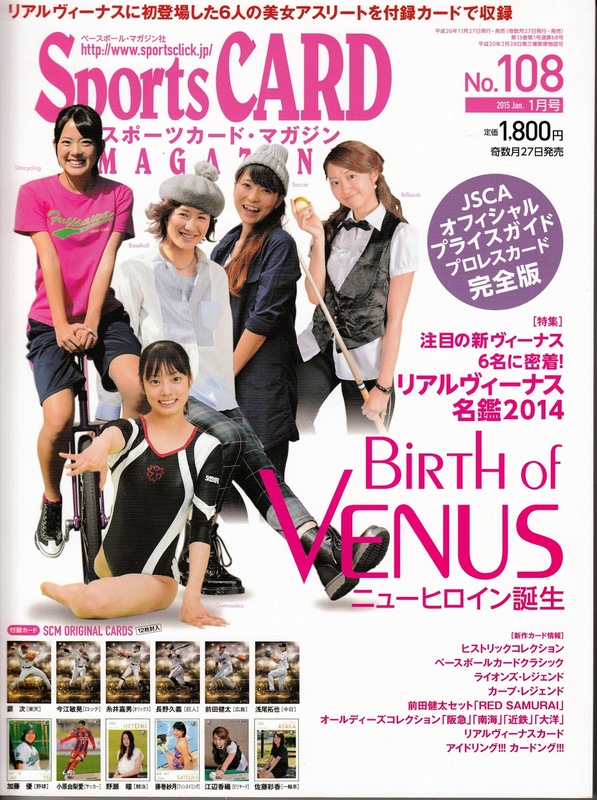 - The set that was released last week was from Sports Graphic Number. 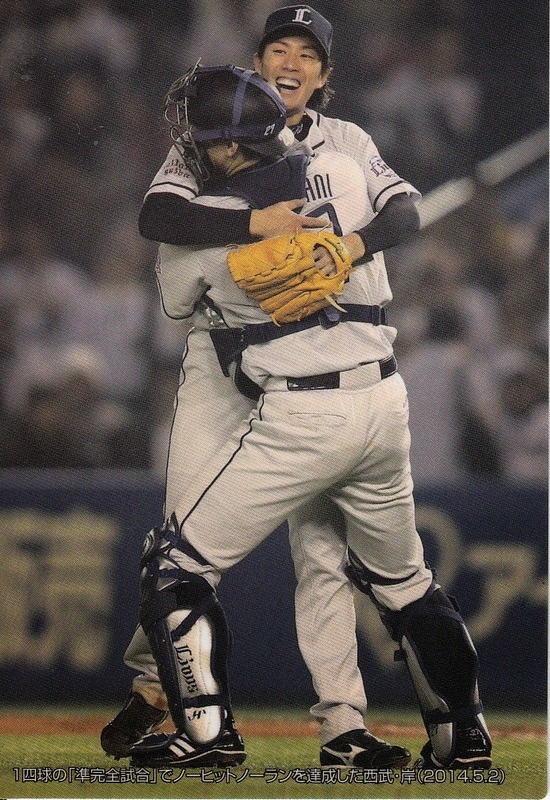 Their previous sets were all dedicated to single players - Hiroyuki Nakajima, Masahiro Tanaka, Kenta Maeda and Tomonori Maeda. 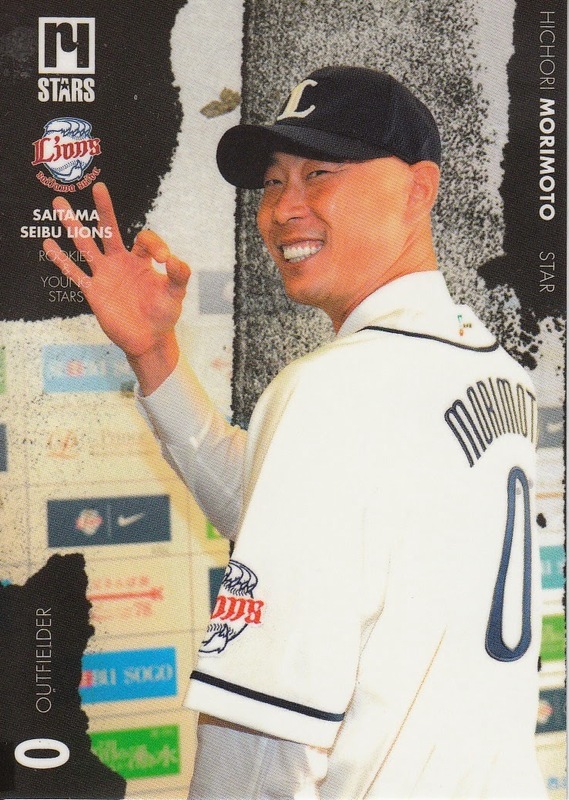 This new set is actually dedicated to three Swallows players - Tetsuto Yamada, Shingo Kawabata and Yuhei (Takai). The base set has 81 cards - 27 for each player. Like their single player sets, the cards have a minimal amount of graphics and simply feature full bleed photos of the players. There are several groups of cards that form a puzzle when put together, again like the single player card sets had. 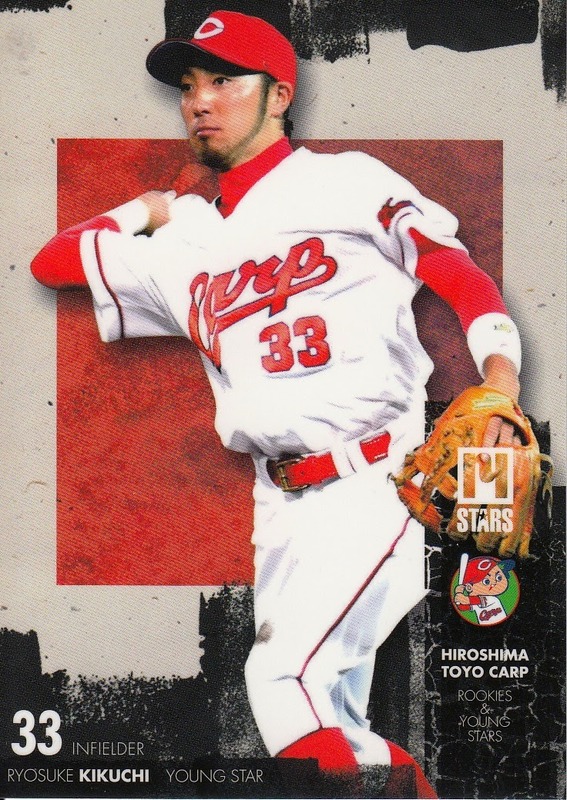 There is also a 36 card (12 cards per player) insert set and I assume that memorabilia cards and parallel cards of some sort are also available. 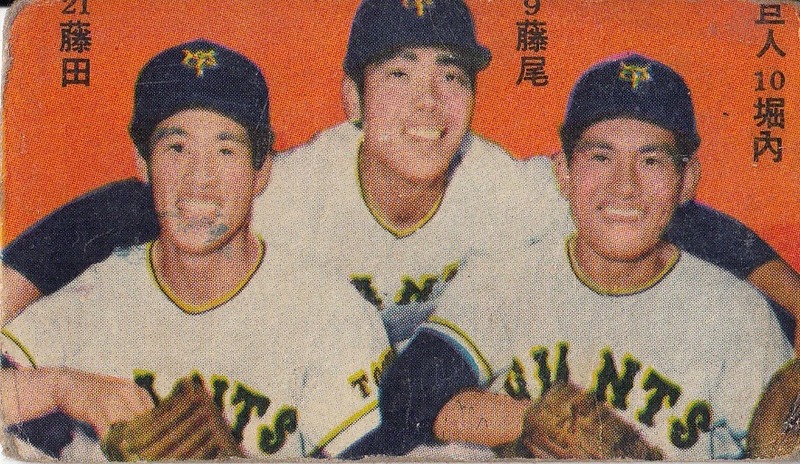 This is a 1957 Maruya menko card (from the set designated JCM 65) showing (from left to right) Motoshi Fujita (#21), Shigeru Fujio (#9) and Sho Horiuchi (#10) (not to be confused with Tsuneo Horiuchi who would not debut for the Giants for another nine year - I don't think they are related). 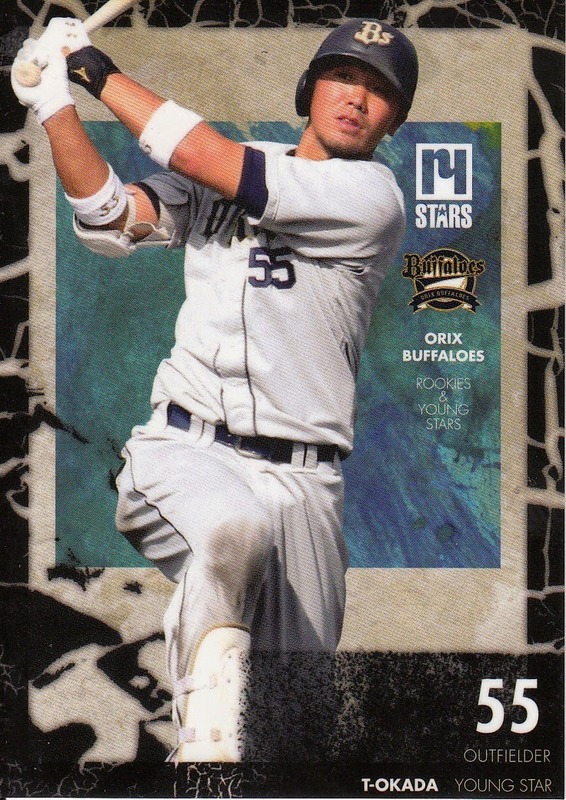 BBM issued their version of the Heritage and Archives sets done by Topps a few weeks back. The set is called Classic and it uses a "classic" BBM card design for current players. This is the second edition of the set. Last year's used the set design from 1991, BBM's first year. 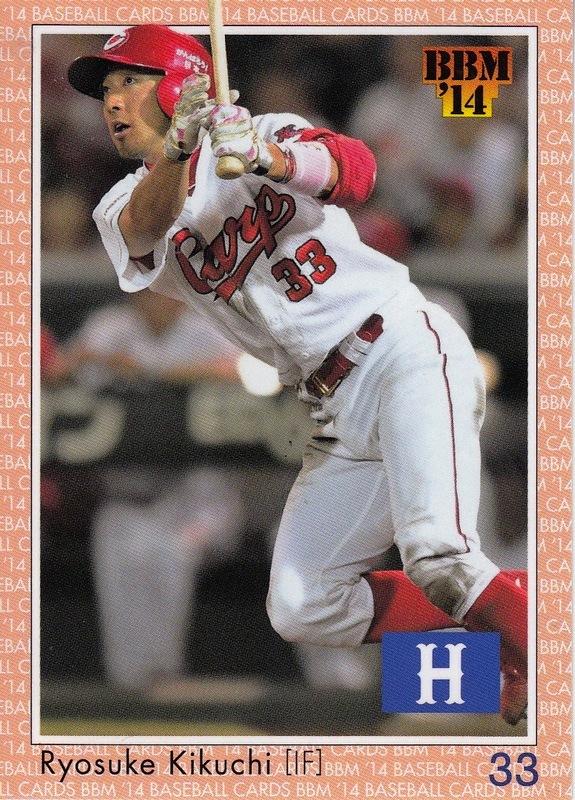 This year they are using the 1992 BBM design so it would probably be safe to assume that, like Topps Heritage, BBM will reuse their old designs in sequential order - in other words, I'd expect them to use the 1993 design next year, the 1994 design in 2016, etc. I need to clarify that when I say the set uses the 1992 design, I actually don't mean the entire set. 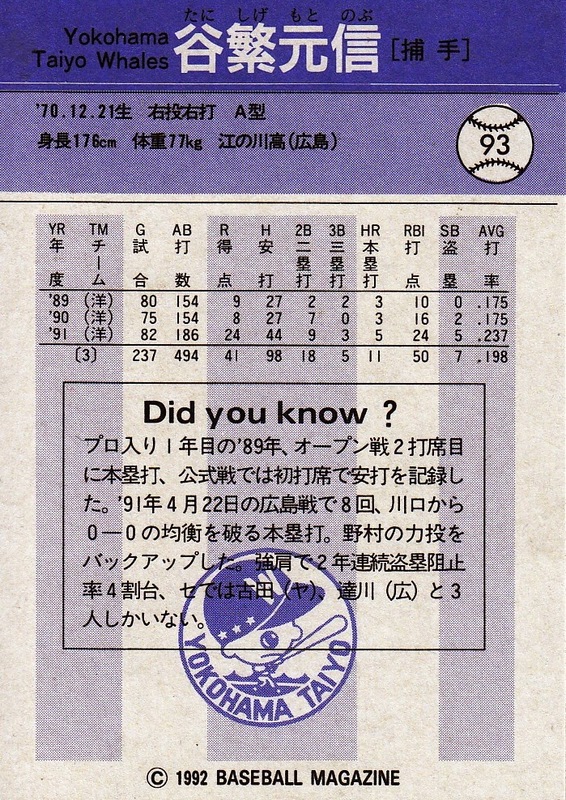 The set contains 108 cards but only 72 of them - the 72 for active players - uses the 1992 design. The other 36 cards are OB players and their cards use a different design. 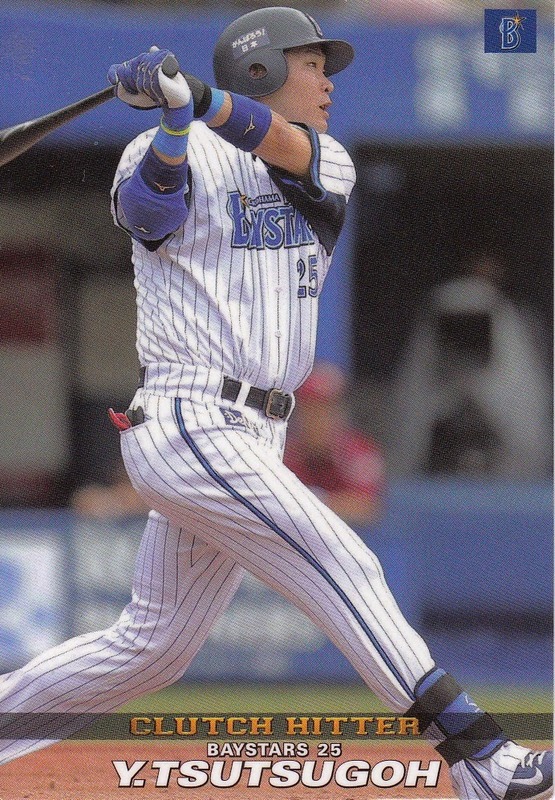 The biggest differences between the two designs is that the team logo watermark on the back of the card has been replaced with a logo for the Classic set and the new cards are the standard size instead of the 2 3/8 by 3 5/16 inches size that the 1992 set used. The 72 active player cards are split evenly between the 12 teams (so there's 6 cards per team). 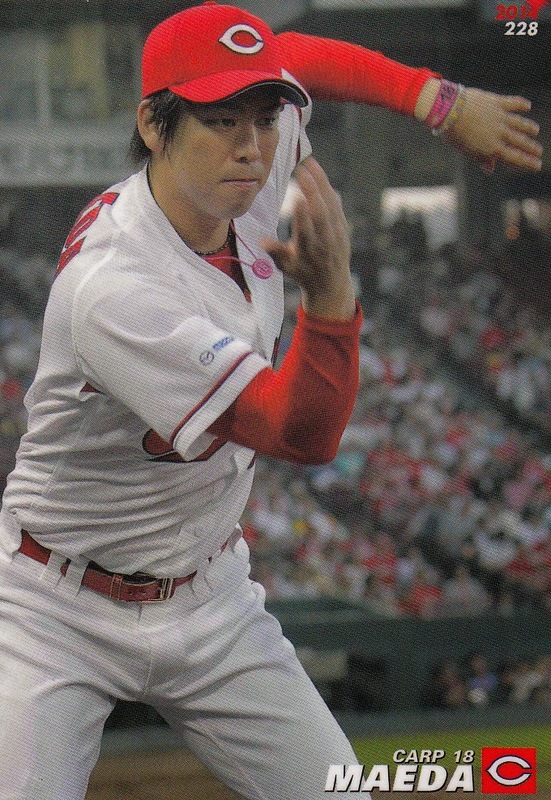 The players included most of the big stars - Shinnosuke Abe, Hayato Sakamoto, Sho Nakata, Shohei Ohtani, Yoshio Itoi, Takeshi Toritani, Matt Murton, Chihiro Kaneko, Yoshio Itoi, Kenta Maeda, Seiichi Uchikawa, etc. 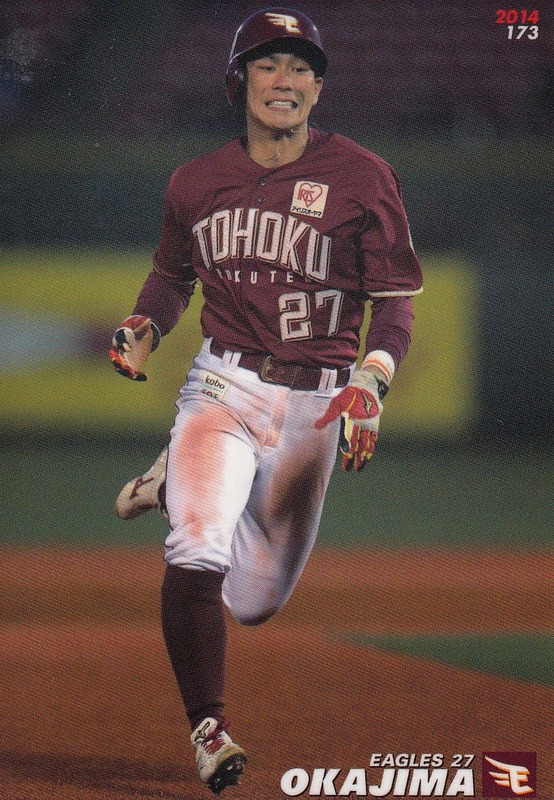 There's also a number of rookies including Daichi Ohsera, Yuki Matsui, and Ayumu Ishikawa. 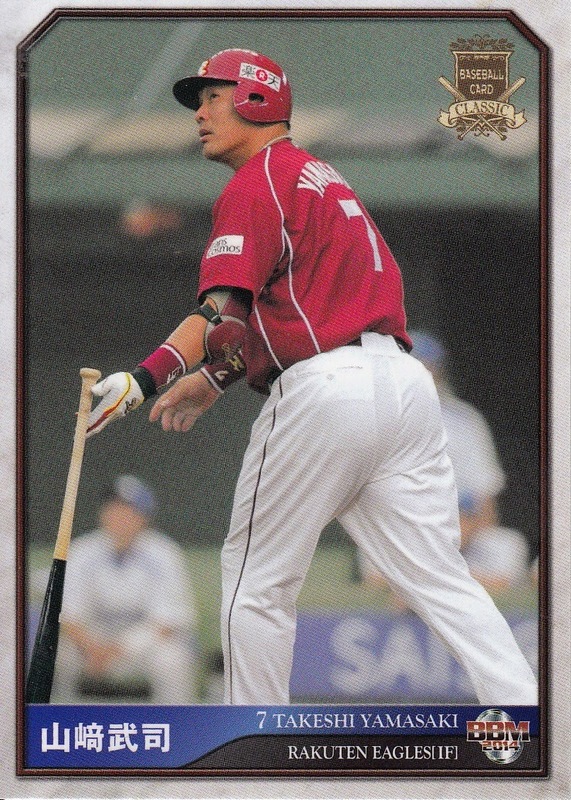 One of the Cuban players, Yulieski Gurriel, also appears in the set. 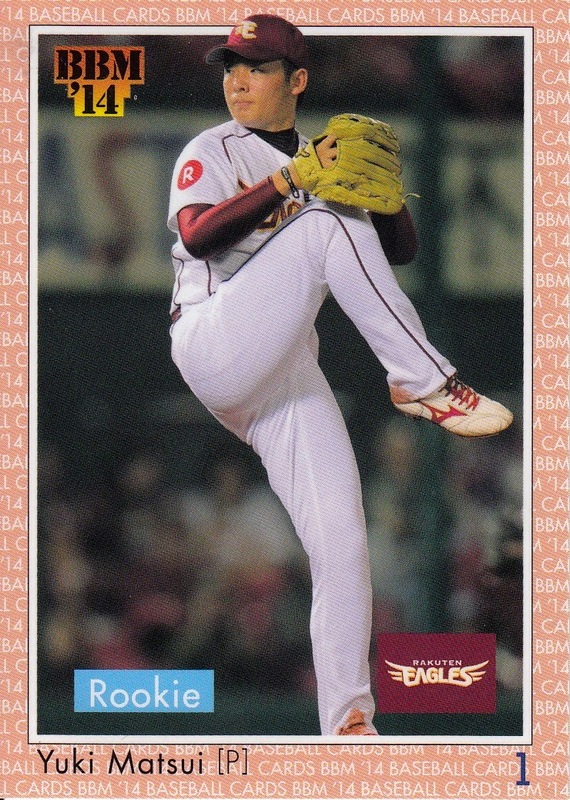 My only real complaint about the cards is that, like BBM's 2nd Version set this year, the photos are pretty generic - pitchers pitching and batters batting. 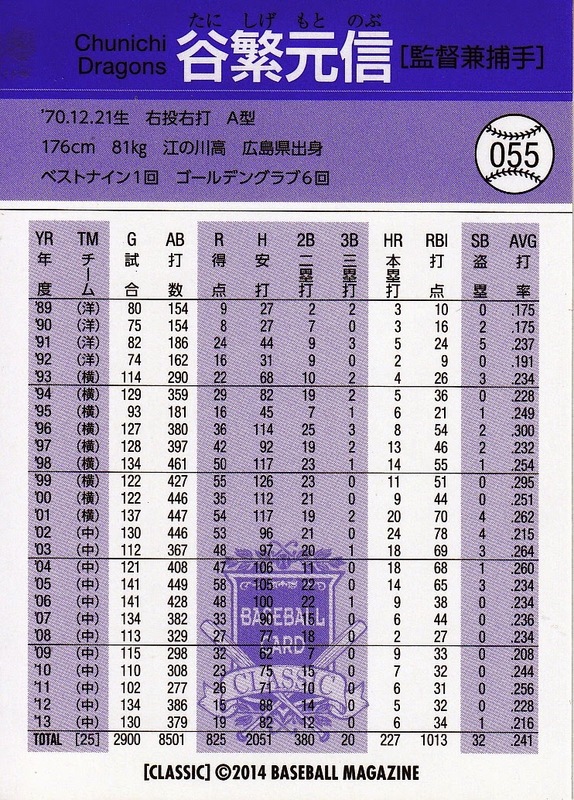 The 36 OB cards are also split evenly between the 12 teams (3 per team). I don't recognize the card design that BBM used for the OB cards - I think it actually is a new design. Not sure what the criteria for inclusion in the OB subset was (other than agreeing to autograph a bunch of cards for BBM). 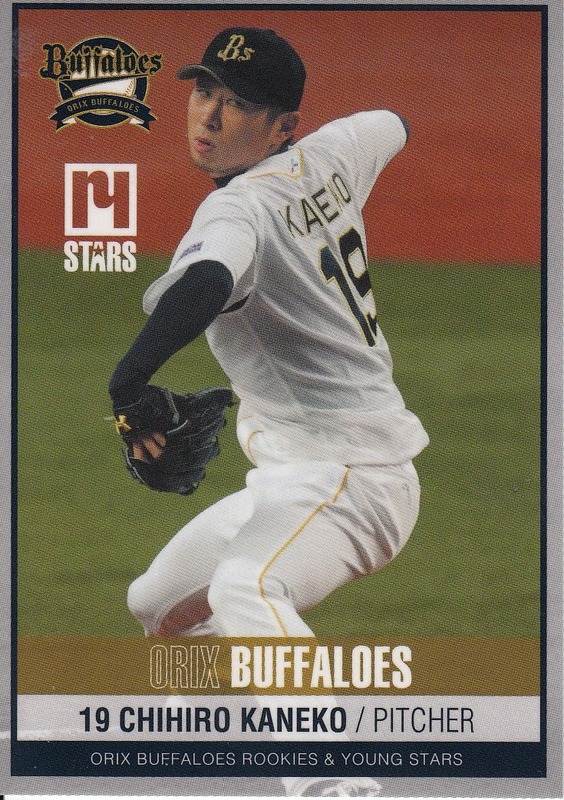 Similar to my complaint about the active player cards, the images on the OB cards are almost all pitchers pitching and batters batting, although Isao Harimoto's card is pretty cool regardless. 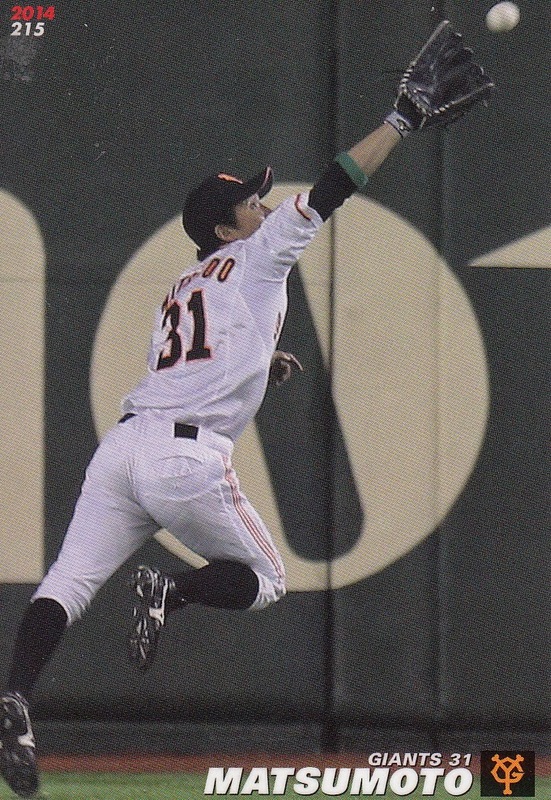 Daisuke Yamashita is the only player shown fielding. I like this set and I really like the concept but I'd like to see BBM improve some stuff. 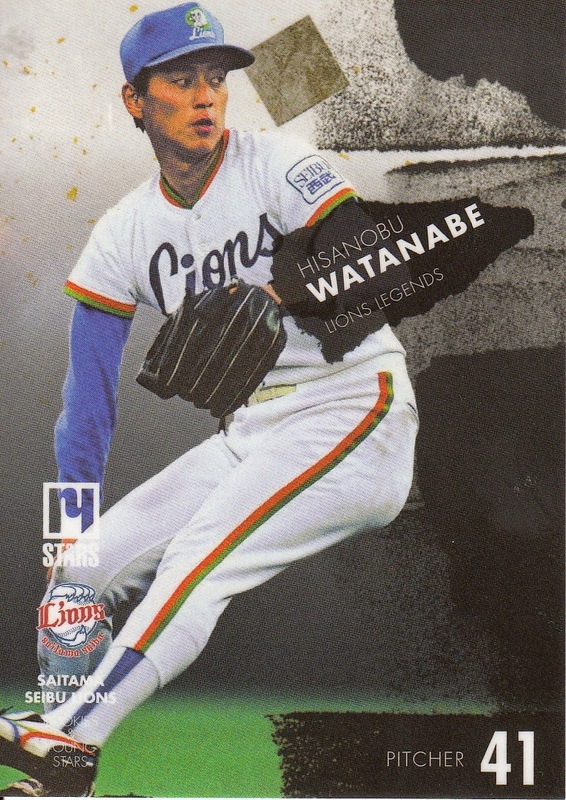 Either eliminate the OB subset altogether (preferably replacing them with more of the current players) or either use an older, non-BBM card design (menko, Kabaya-Leaf or even use a Topps design) or use the same format as the rest of the cards (like Topps has done with Archives). One thing that BBM could have done with this set that would have been cool was to replicate a couple of the subsets from the original set. 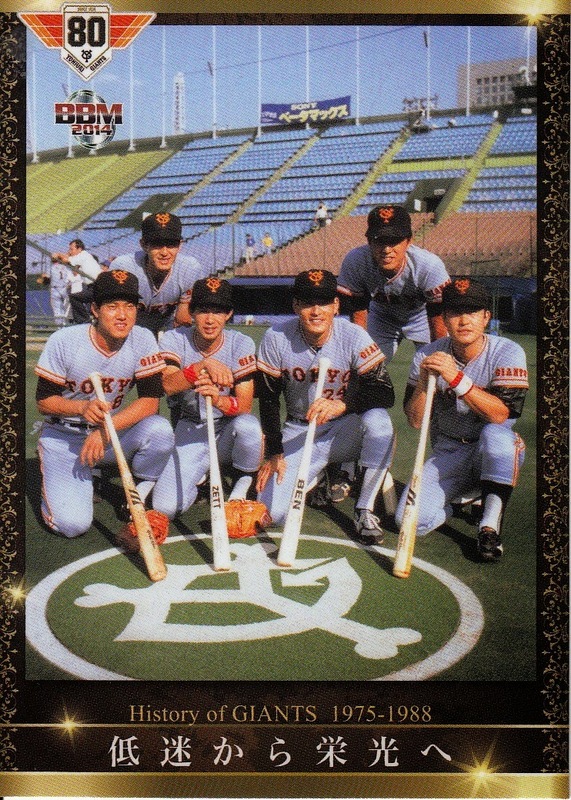 The original set had a subset dedicated to the 11 ballparks in regular use at the time (the Fighters shared the Tokyo Dome with the Giants). Five of those ballparks are no longer in regular use (and only two of those are still standing) and one of the others (Seibu Dome) is significantly different than it was in 1992 (it has a roof on it now). This would have been a great opportunity to have an up-to-date ballpark subset. In addition, the original set had a subset of multi-player cards (all with two players). 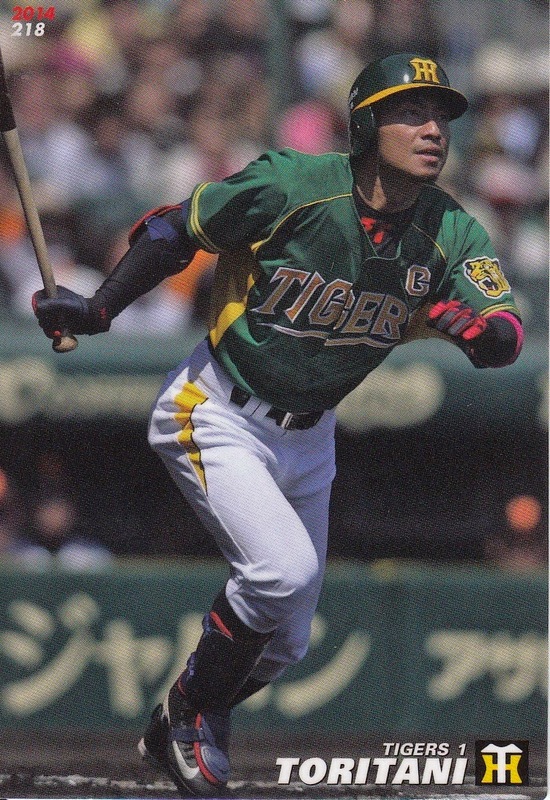 Since BBM hasn't done multi-player cards in their flagship sets since 1996, this would have been a good way to bring the concept back. Jambalaya has all the cards here, including the inserts. 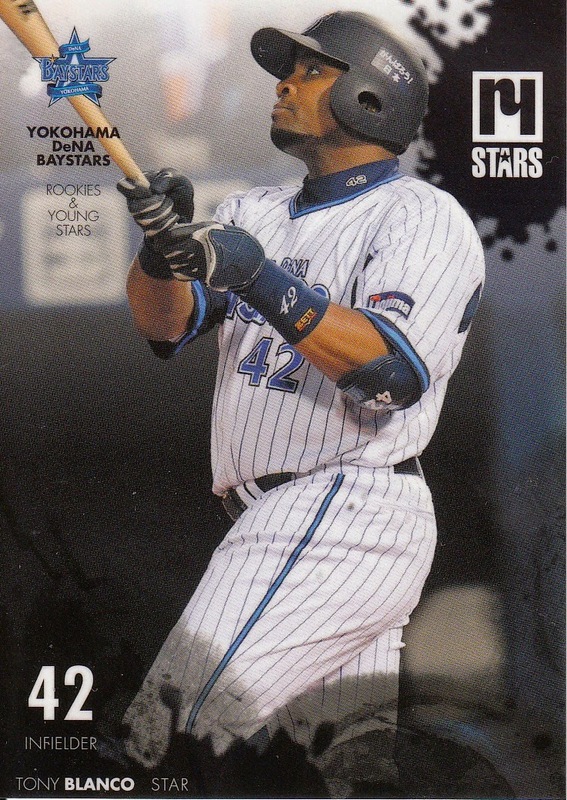 The latest issue of Sports Card Magazine (#108) hit the newsstands in Japan this week and I got my issue from Amazon Japan via DHL today (ordered it on Wednesday, got it just over 48 hours later!). Like last issue though, this isn't a great issue for the Japanese language illiterate like myself. The cover "story" is basically a five page promotion for this year's edition of BBM's annual Real Venus set which is dedicated to women athletes. Nothing wrong with the set itself but as it's not a baseball set, I personally am not that interested in it (although it does feature a baseball player - more about that in a minute). 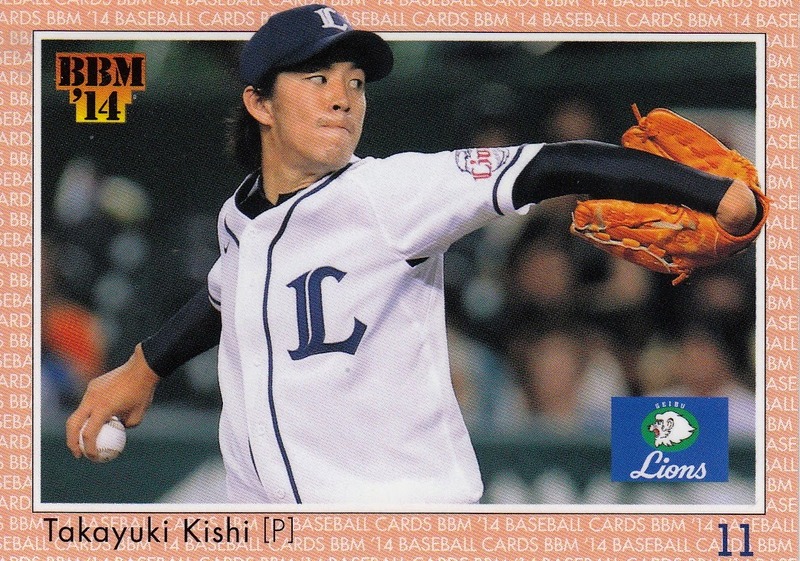 The "New Card Information" section includes two page spreads on the new "Memories Of Uniform" and "Classic" sets as well as information on the "Lions Legend", "Carp Legend", "Red Samurai" and the "Achievement" box sets for the Hawks, Braves, Buffaloes and Whales. The section also includes full page promotion sheets for the "Idoling" set and the "Real Venus" set (so six of the 16 color pages in the magazine are dedicated to the "Real Venus" set). The "newsprint" section of the magazine has a four page article related to the new "Memories Of Uniform" set - I think it talks some about uniforms that did not make the set. This month the rotating checklist & price guide spotlights pro wrestling cards. 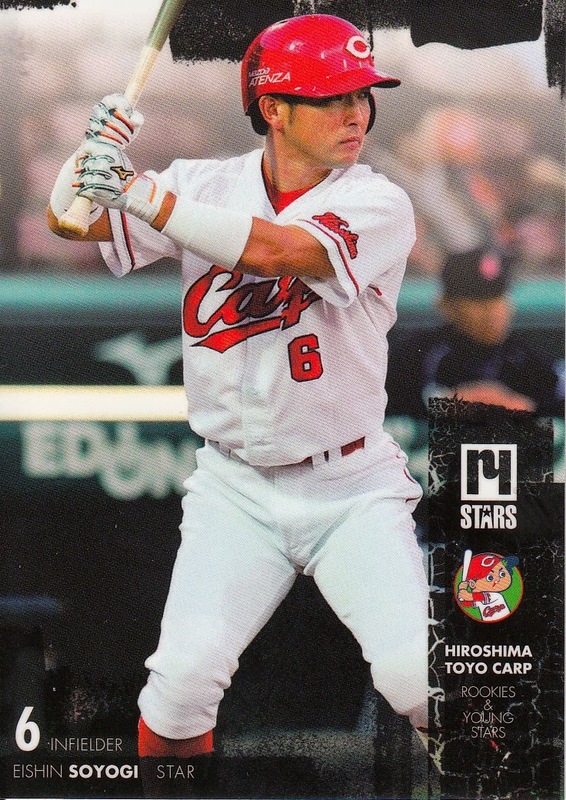 There's also a checklist & price guide for all the 2014 baseball issues (up to October) from BBM and Calbee (although no Front Runner sets and only the Nagashima set from Epoch). There is also a "New Card Checklist" for all the BBM issues that have been released or are scheduled to be released between October and the end of the year. I'm a little bummed about the baseball cards included with the magazine. Like every other issue this year, the magazine included 12 cards. Six of them are the final six cards for the "Cosmic Cross" set that BBM has included in all the issues this year. 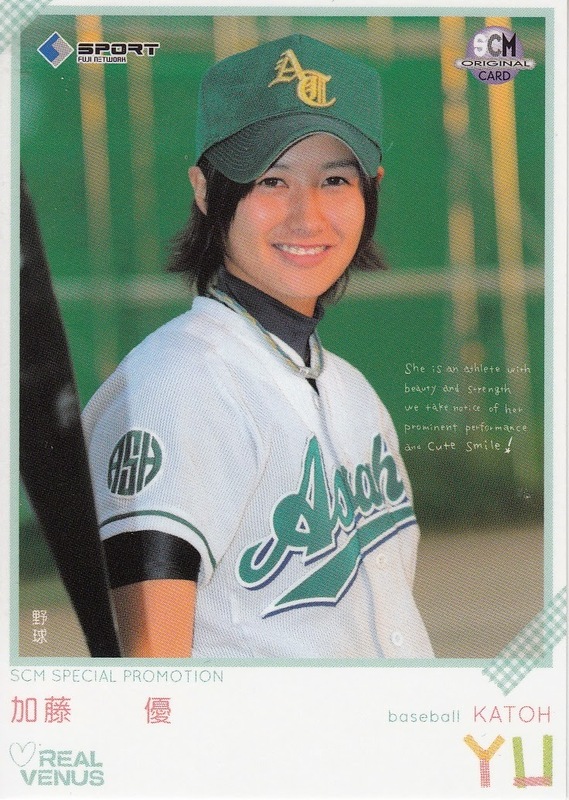 The other six are all promo cards for the "Real Venus" set - baseball player Yu Katoh, footballer Yuria Obara, swimmer Hitomi Nose, fin swimmer Satsuki Fujimaki, billard player Kaori Ebe and unicycler Ayaka Satoh. As I mentioned above, I'm not all that interested in the "Real Venus" set so I would have preferred promo cards for baseball issues. 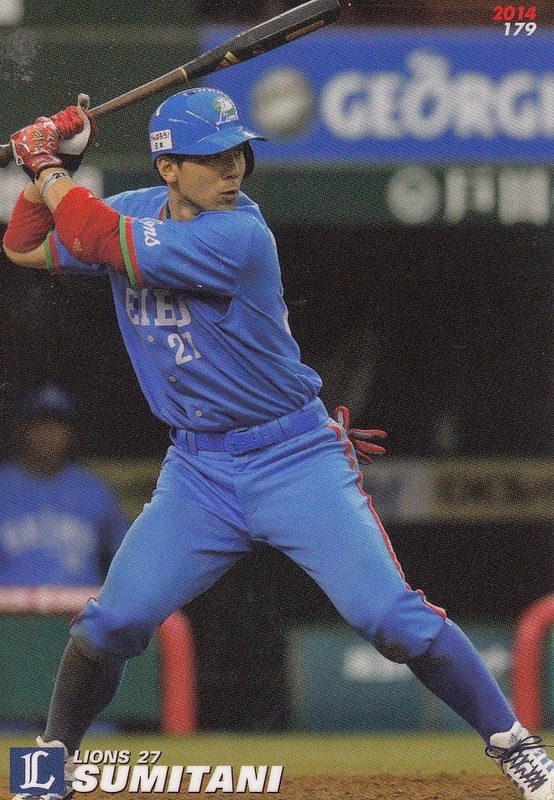 I've been trying to do a little bit of research on Yu Katoh but beyond discovering that she was a candidate for the women's Samurai Japan team, I haven't found out too much. It looks like she plays for a team called Asahitrust - I don't know what that is. Are there industrial league teams for women or are there women on industrial league teams? Got a couple sets in the mail yesterday a little quicker than normal. 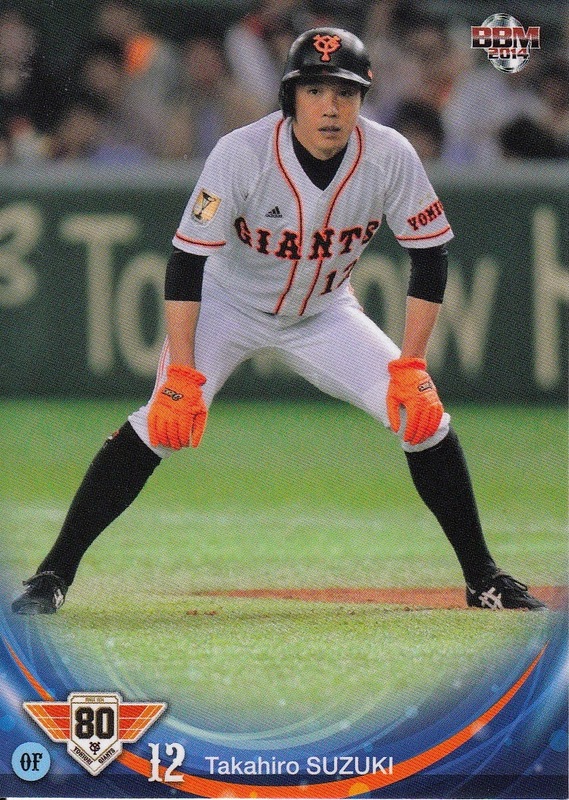 One of them was BBM's latest team Anniversary set - the Giants 80th Anniversary set. 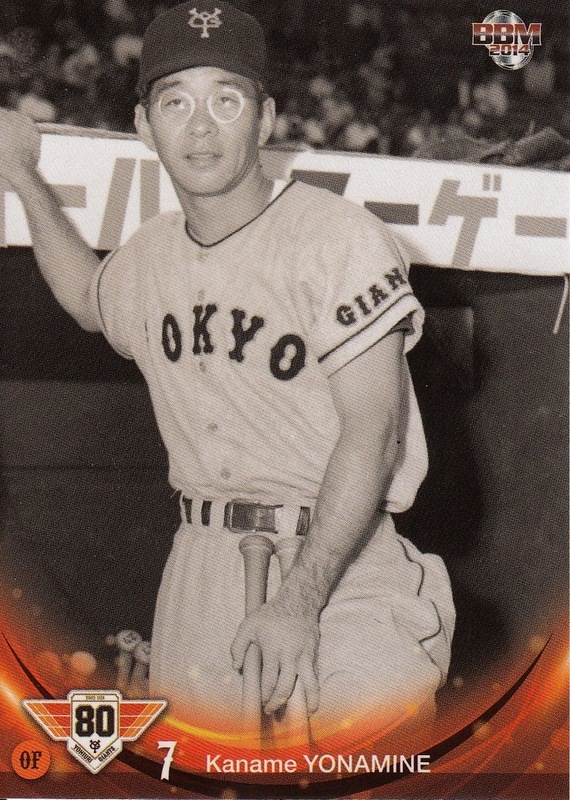 The second subset is for OB Giants players. 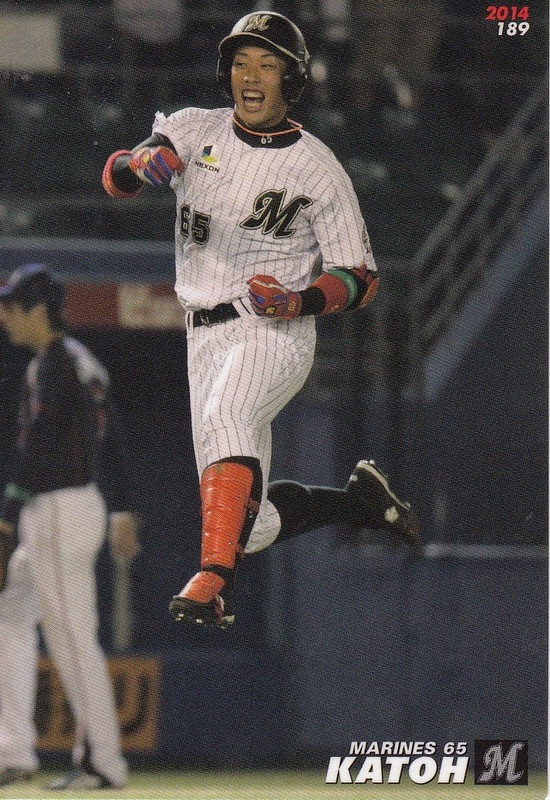 As usual in these sets, "OB" players include both retired players and former Giants players who are still active in either NPB or MLB (or in one case, the Baseball Challenge League). At 69 cards, this is the largest subset in the set (as you'd probably expect). 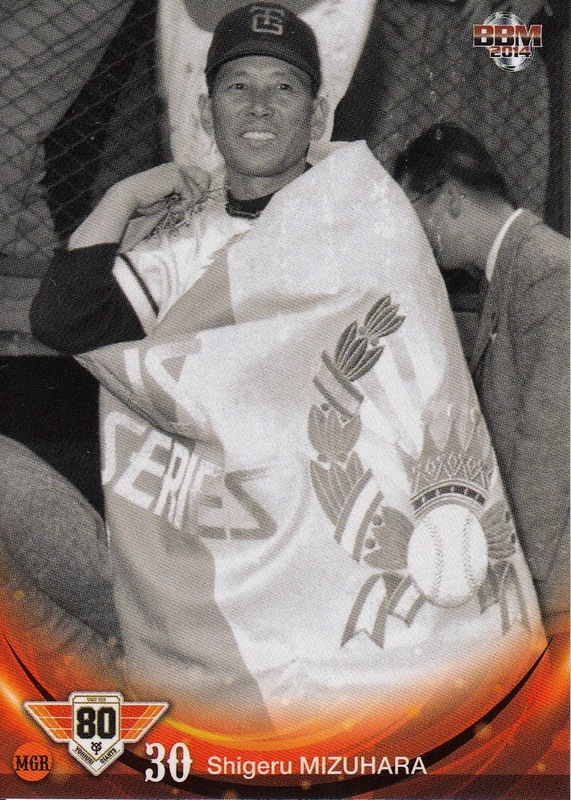 Also as you'd expect, the subset contains Sadaharu Oh, Shigeo Nagashima, Isao Shibata, Isao Harimoto, Tetsuharu Kawakami, Hideki Matsui, Tatsunori Hara, Tsuneo Horiuchi, Kiyoshi Nakahata, Koji Uehara and Suguru Egawa. 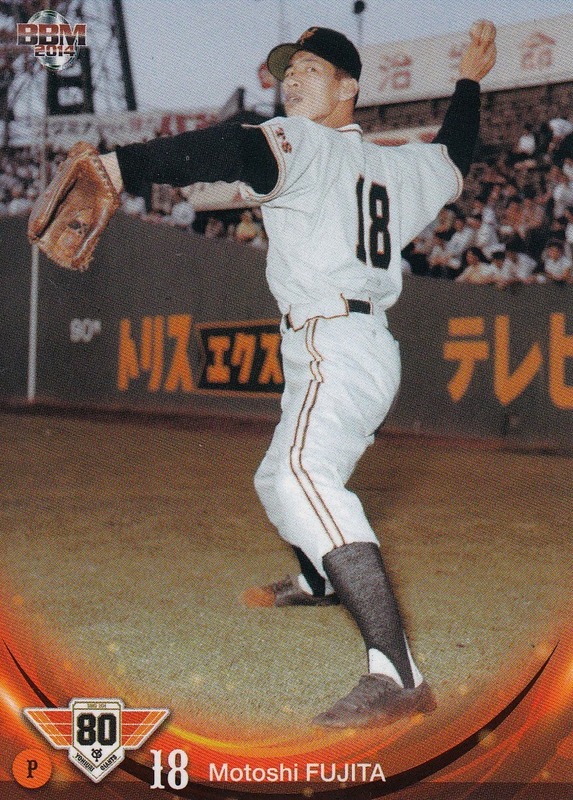 There's a good selection of older players like Eiji Sawamura, Victor Starffin, Noburo Aota and Shigeru Chiba, although as usual the bulk of the players represented are from the 1960's and later. 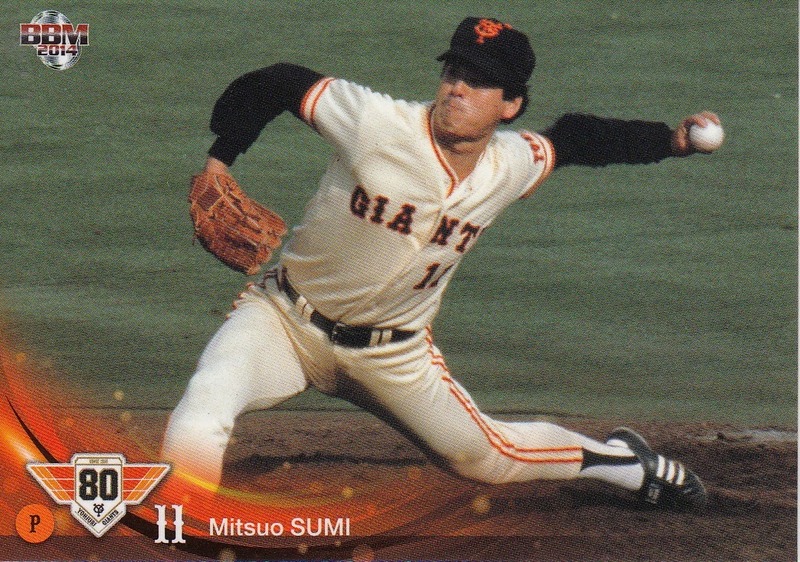 Every Giants manager is included in the set either as a player or a manager - Sadayoshi Fujimoto, Haruyasu Nakajima, Hideo Fujimoto, Osamu Mihara, Shigeru Mizuhara, Kawakami, Nagashima, Motoshi Fujita, Oh, Hara and Horiuchi. 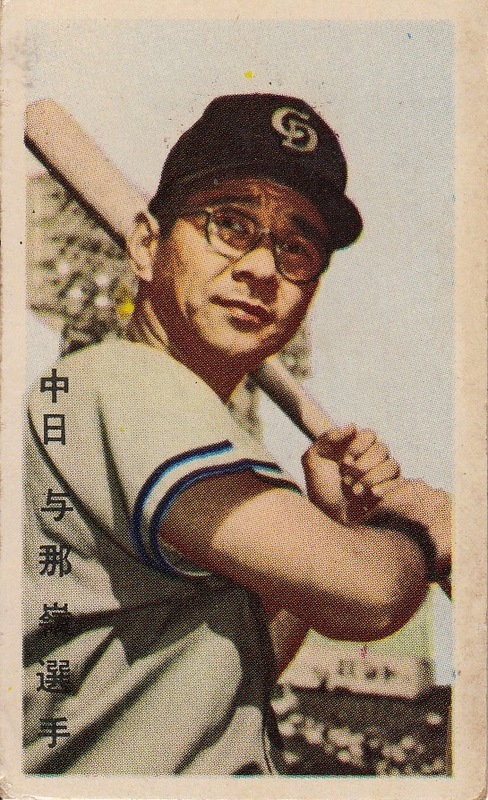 There is a notable lack of foreign players - only Wally Yonamine and Alex Ramirez are included in the set. Warren Cromartie is probably the biggest foreign player omission but Tuffy Rhodes wouldn't have been out of place in the set. 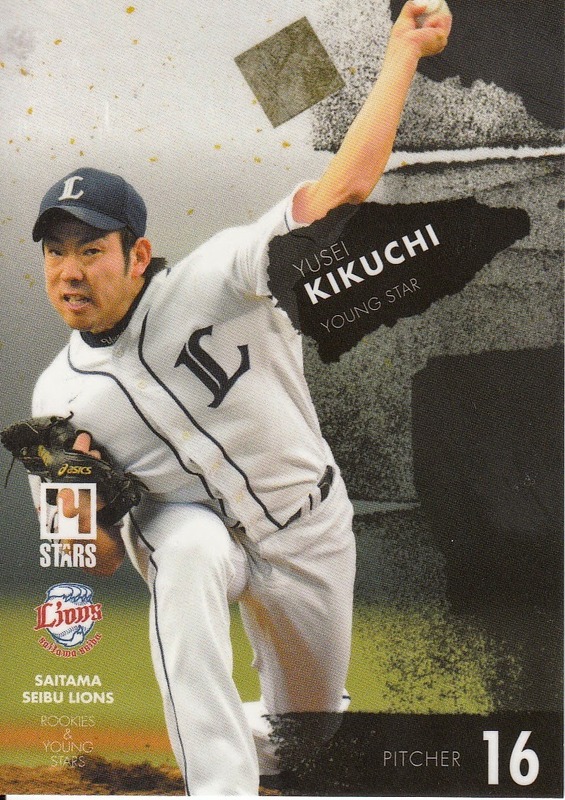 I was kind of surprised to see that Kazuhiro Kiyohara was not included in the set. 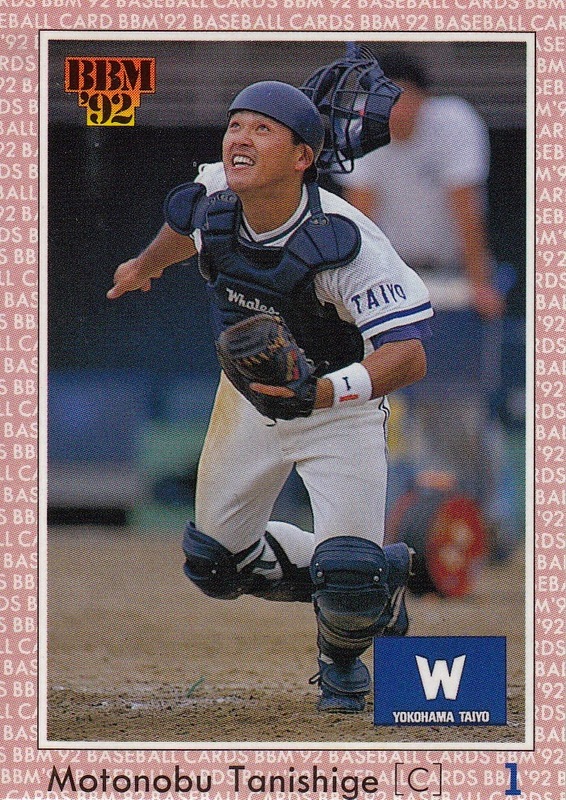 I was less surprised to see that Hiromitsu Ochiai and Masaichi Kaneda are not in the set as Ochiai has not appeared on a baseball card since 2011 and Kaneda doesn't show up very often. 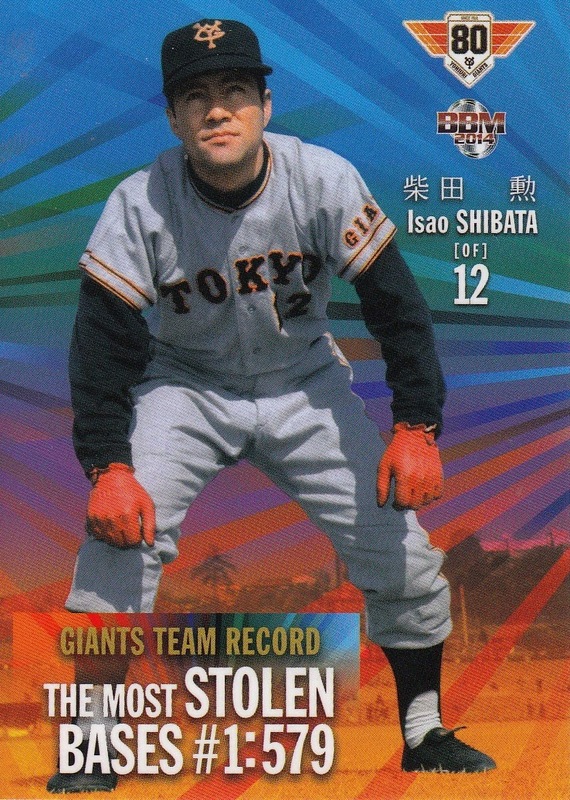 The final subset is a nine card "Giants Team Record" subset. This features nine different players (five batters and four pitchers) and nine different statistical categories. 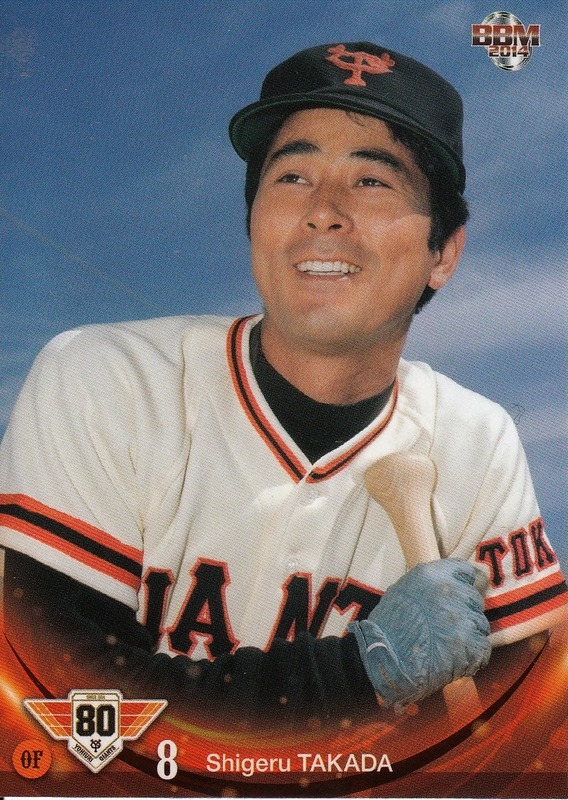 Three of the batters don't actually lead the statistical category they represent on their card - Shigeo Nagashima is #3 in games played (Sadaharu Oh is #1), Tetsuharu Kawakami is #3 in hits (Oh is #1) and Tatsunori Hara is #4 in RBI (Oh again is #1 - both for the Giants and for NPB). 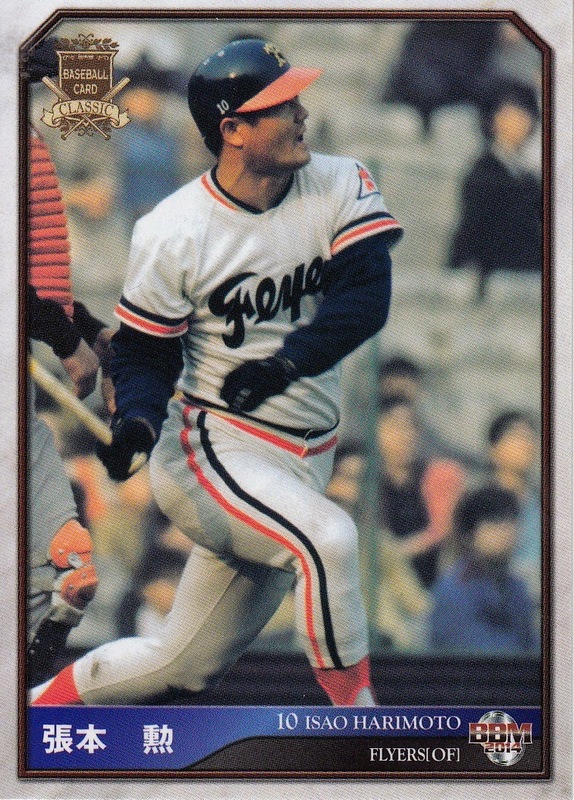 Everyone else in the subset is #1 in the category on their card - Oh (home runs), Isao Shibata (stolen bases), Tsuneo Horiuchi (games pitched), Takehiko Bessho (wins), Hiromi Makihara (strikeouts) and Mitsuo Sumi (saves). If it isn't clear from what I've written, I do like the set. 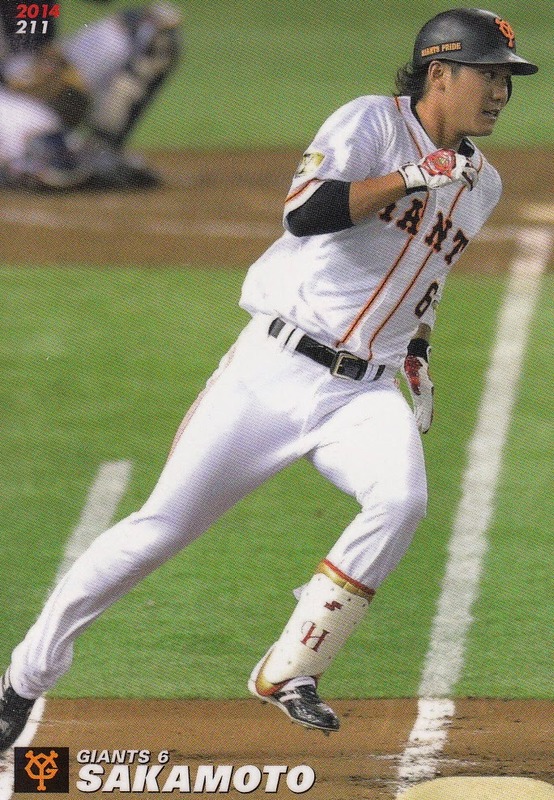 It's attractive and a good representation of the history of the Giants. 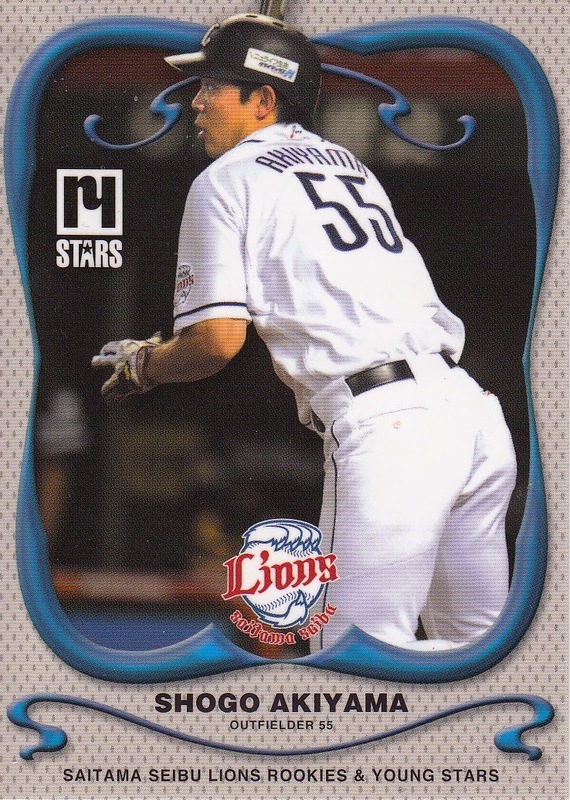 I have to say that this is kind of like seeing Harmon Killebrew in a Kansas City Royals uniform - it just doesn't look quite right. 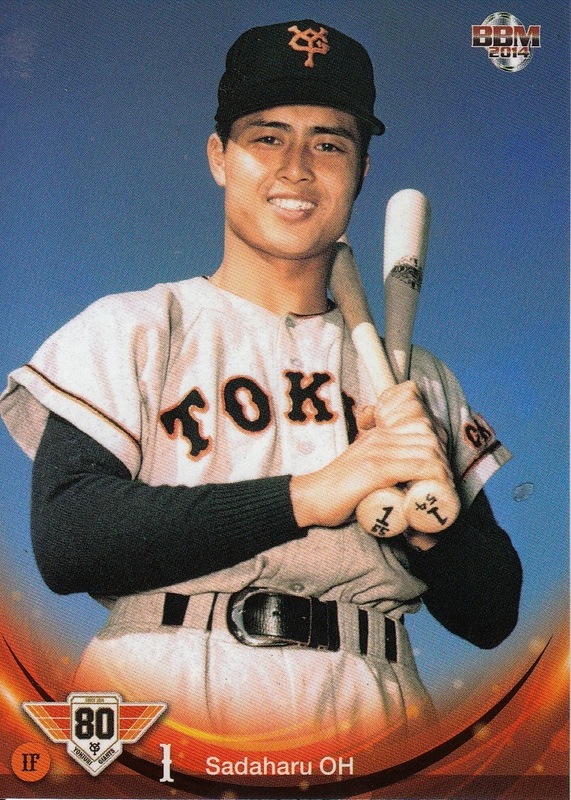 This isn't directly Japanese baseball card related but Ralph Pearce, author of From Asahi To Zebras: Japanese American Baseball In San Jose California and one of the "pioneers" of the hobby, has co-written a new book on San Jose's Japantown. The Japanese American Museum of San Jose is putting on a launch party for the book on November 29th at 1 PM at the San Jose Buddhist Church Gymnasium (650 N. Fifth Street, San Jose, CA 95112) so if you're in the area, stop by and say "hi" to Ralph. 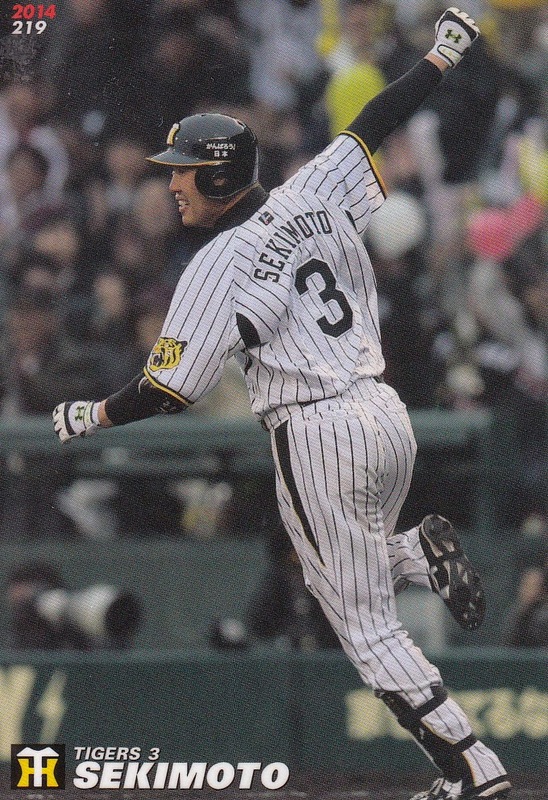 The last of the sets I got from Hiro a few weeks back was this year's Series Three from Calbee. 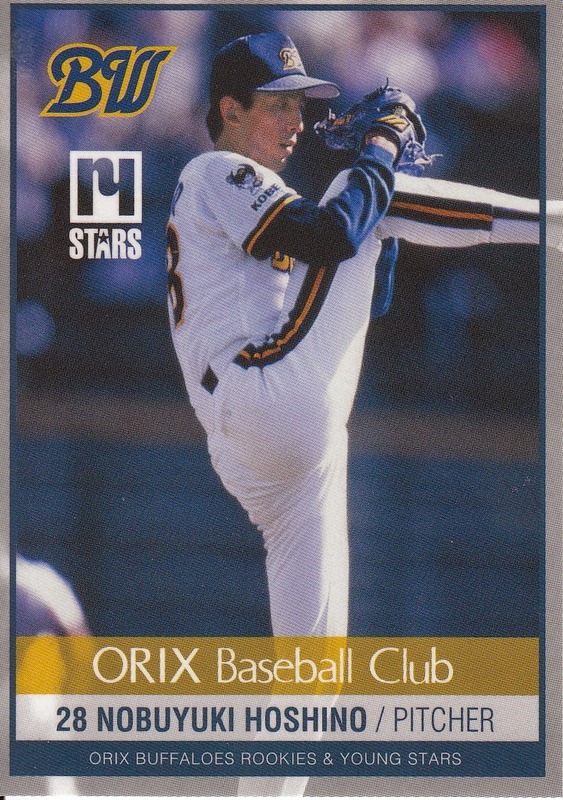 Like the previous two Series, there was 100 cards in the set - 84 player cards (7 per team), a 12 card "Clutch Hitter" subset/non-premium insert set (1 per team) and four checklist cards. 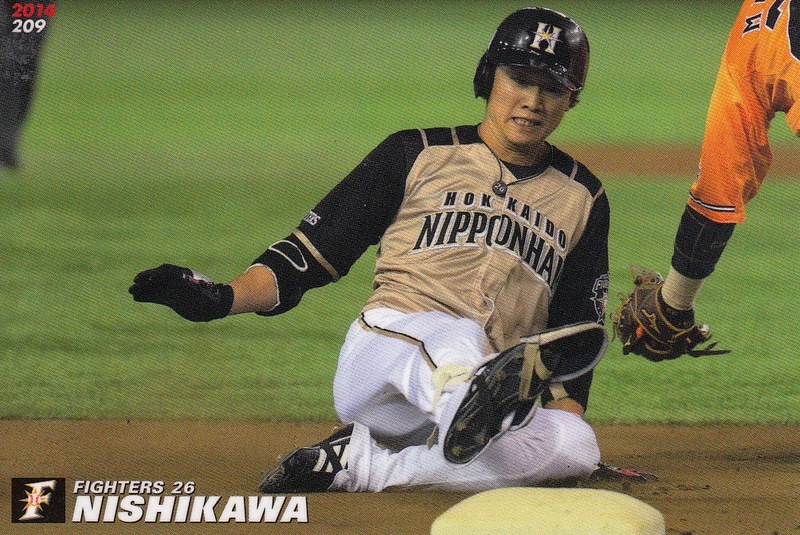 One minor disappointment with the set is that there's only one card that uses a horizontal format. 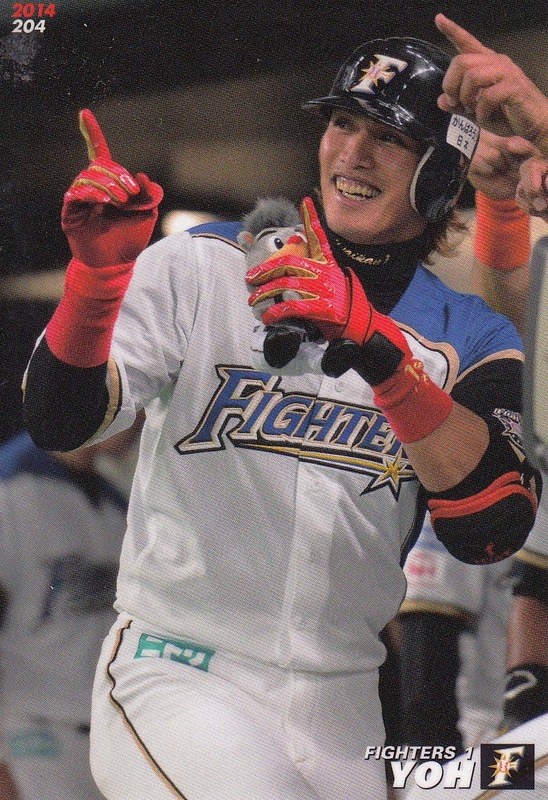 Nearly half (37) of the 84 players depicted in the set appeared in either the first or second Calbee Series this year as well. 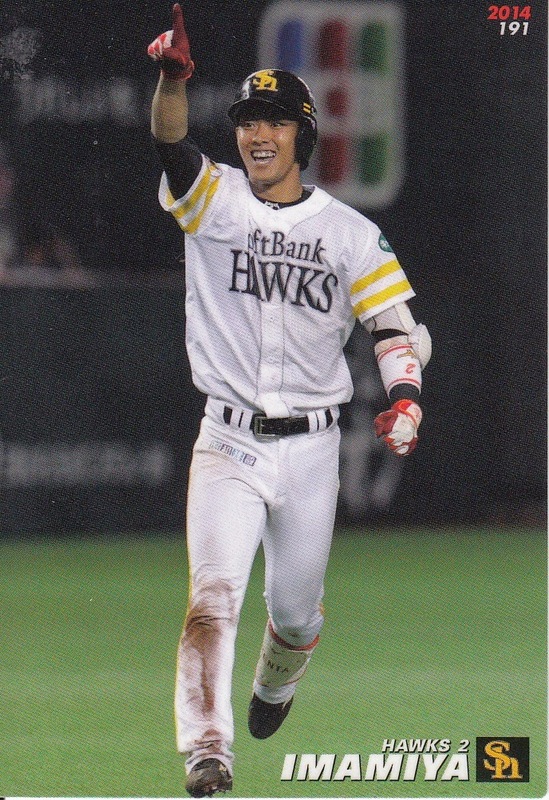 In fact, there's five players who appear in all three of this year's Series - Hayato Sakamoto, Sho Aranami, Yoshio Itoi, Kenta Maeda and Takeshi Toritani, If there was one thing that I'd like Calbee to change, it would be that I'd like less repetition of the players. The "Clutch Hitters" subset is kind of uninspiring - all twelve players are depicted batting (as you might expect). 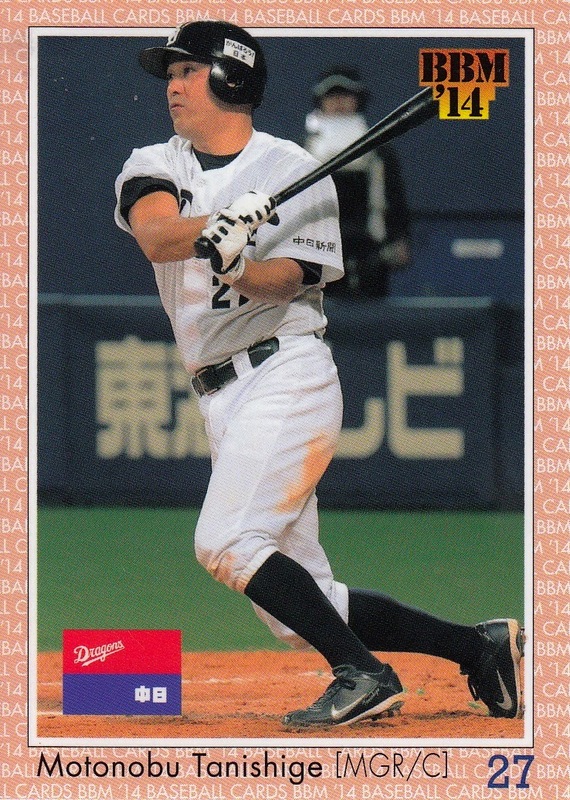 This is the only Calbee card for four of the players this year - Ryota Arai, John Bowker, Itaru Hashimoto and Anderson Hernandez. As always, all the cards can be seen at Jambalaya.